: Near the Cirque d’Hiver in the 11th arrondissement, this gastronomic restaurant welcomes guests in an oblong setting with three dining rooms. Jacky Ribault, the Brittany native chef who has worked in establishments such as L'Arpège, takes great care to pick the right products and choose the wine pairings from the cellar stocked with one hundred vintages. Served in small portions, dishes impress thanks to the creativity of the chef who likes to highlight Asian flavors and associate many ingredients. The combination of textures is pleasant as well, as one dish can be crunchy and melting at the same time. 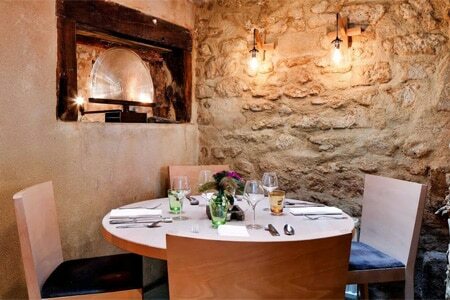 For €85, expect a Carte Blanche menu full of surprises. A complete crab, both soft and fried, is offered as an appetizer in a fish broth with herbs. Pan-seared and mango-marinated scallops are enhanced with sesame and groundnut. Roasted red mullets are soaked in a fish broth, with crushed tonka bean and pan-fried cabbage, while the foie gras is drenched in a dashi broth with dandelion and combawa. Squab comes cooked two ways, the supreme stuffed in a ravioli and the thigh caramelized in pine juice. The finale is provided by a complex dessert, the “rhubarbapapa,” a rhubarb tart with crème fraîche and vanilla coated with candy floss.